Just two years into the 1939-45 War, Britain was suffering a serious shortage of suitable training rifles. With all local manufacturers committed to the far higher priority of Service arms production, there were simply not enough small calibre rifles to go round. Local Defence Volunteer units ( latterly Home Guard) were utilising almost anything on which they could lay their hands, and such small-bore rifles as were in stock with gunsmiths or manufacturers were taken over by the War Office for distribution anywhere thay might be of value for economical trainig purposes. The U.S.A. were already supplying much miltary materiél, and a request was made for a consignment of .22 rimfire rifles suitable for the purpose. The Mossberg Model 42 rifle was a sporting/target based design which offered an excellent basis on which minor modifications could comparatively easily be made to current production lines; the substitution of the three-quarter length stock with a full-length military style stock being the most significant and obvious. The initial contract, in June 1941, was for 10,000 rifles. 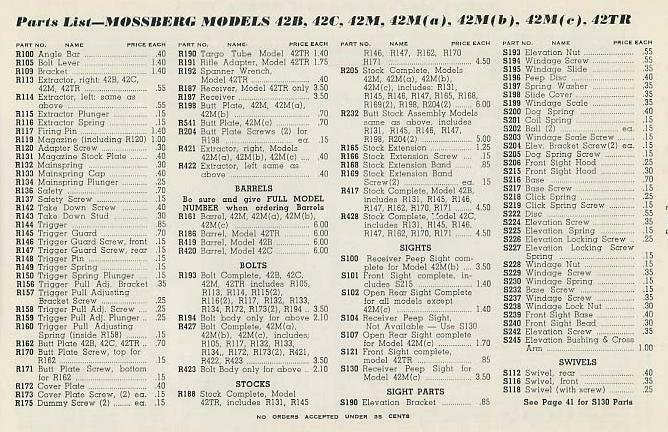 Previous to this date, Mossberg had used only a letter code on their production rather than serial numbers. Arranging to add the serial numbers required by the British Government took time, and the first 2,500 rifles left the factory not so marked. Thus the latter three-quarters of that contract ran from serial number 2501 to 10,000, and no earlier numbering should be seen. There was, not surprisingly, a delay in the despatch of this early batch due to the numbering requirement. There were further contracts for rifles over the next eighteen months; a batch of 8,000 later in 1941, another 20,000 in March 1942, spares in June, and two more batches of rifles, totalling 8,000, early in 1943. Precise numbers allotted between U.S. and British destinations are not known at this point, but most production came to the United Kingdom. The sights shown above are those fitted to the rifles for the U.S. home market. The fore-sights on the British contract rifles were also tunnelled, but that tunnel was slightly shorter and on a shorter ramp. The sight itself was not at all dissimilar to that fitted on the Ross Cadet rifle nearly thirty years earlier. Originally only fitted with a barrel mounted tangent rear-sight, the British early contract rifles had the Mossberg S102 receiver mounted aperture sight added to emulate the rear-sight of the Lee-Enfield No.4 Rifle. 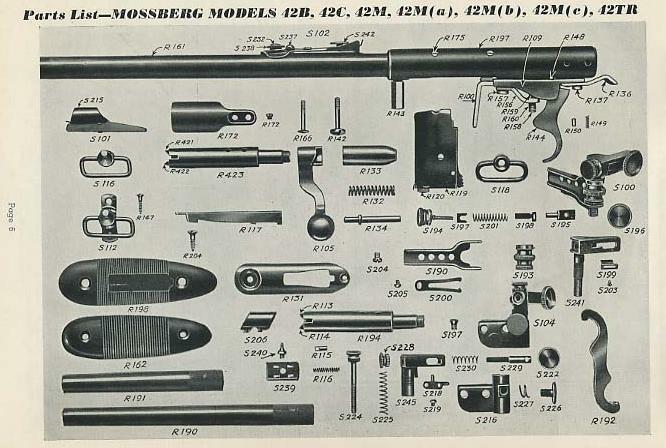 It has to be said that the Mossberg was a very light-weight representation of the No.4 rifle, and far less realistic than other training rifles of its era - the best of which were simply small-bore versions of the parent service rifle, such as the SMLE No.2 MkIV* and the later No.7 Rifle - but, at that time, it was a case of "needs must when the Devil drives". The rear aperture sight used by Mossberg was acknowledged to be rather fragile, it not having been designed for service-style use. 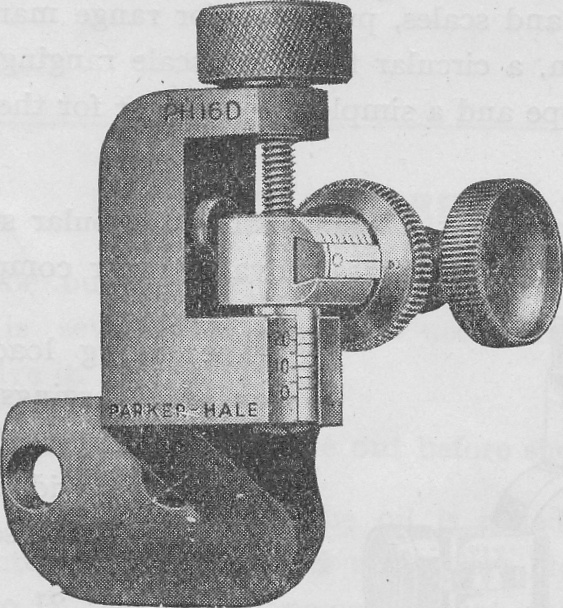 Many were damaged, and Parker-Hale modified one of their "Sportarget" rear-sights with a bracket to fit the left-hand side of the Mossberg receiver. These sights were fitted, Post War, to many of those rifles which escaped return to the U.S.A. under the Lend-Lease contract terms. Such rifles are easily identified by the stampings "UNITED STATES PROPERTY" on both the barrel and the receiver. for .22" calibre Mossberg rifle model 42 M.B. Steel protector fixing screw - 2/6d. This rifle is worthy of good sighting equipment, so we have adapted our Receiver type Sportarget aperture backsight to replace the original frail and unsatisfactory aperture backsight provided by the makers. The Sportarget sight has clear scales for vertical and lateral adjustments with distinct clicks for each half minute. A half minute click makes a movement on the target of 1/8th of an inch on a 25 yards range, which is fine enough for the most expert rifleman. It is supplied with two screws to fit existing screw holes. In 1941 Mossberg received the first government contract for this .22 calibre training rifle. ued as the military removed them. "United States Property" stamped on barrels and receivers. Most rifles were sent to Britain under the "Lend Lease" program and British Proof Marks abound on these specimens. The 42M-B's were serial numbered 2,501 to 46,000. This was the first time Mossberg used serial numbers since the "Letter" designated rifles. After the war most of the "lend Lease" rifles were returned to the United States and some were returned "Sporterized", with various British so called "improvements". See Parker Hale example. n over initials BNP indicate Birmingham Proof House. rossed flags separated by 3 letters indicates date stamp. A question was asked as to the reason for the paint daubs, here is the answer: The daubs are sentencing marks indicating that it was examined and found wanting for something but it was good enough to store pending repair. It could be as simple as a missing sight or it does not have the latest upgrade. The Mossberg's were factory rebuilt in 1948 and fitted with Parker Hale rear sights. Yours may have been scheduled for the upgrade and was surplused out before it could be done. Rifles having been updated to the post war specification have the wartime code for the upgrade company and year date stamped on the receiver ring. 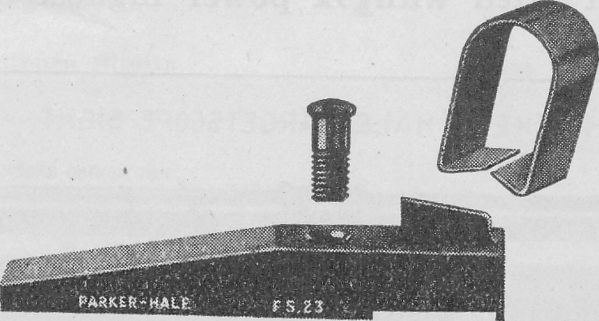 They wanted a receiver sight as the .22s were to duplicate the sighting setup on the No.4 rifle. Thanks Mossberman for the photo's and information. *Contract delayed while rifles were serial numbered. **Some rifles were stamped 42M-B(a) due to an extractor change.